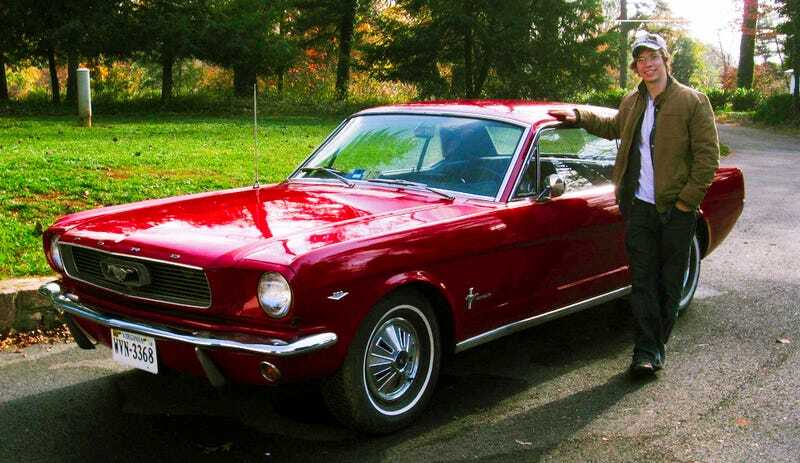 The story of my once-abandoned 1966 Ford Mustang is complicated. It involves a dead professor, a lawyer, Matt Hardigree and my brother. Last month, I wrote about how my five junky cars were ruining my life and how I clearly needed help. You, our genius readers, came to my aid, dishing out insightful advice on how I could kick this addiction and perhaps someday escape from my garage-dungeon and speak to humans other than the parts-delivering UPS guy. But now I have an admission to make: I’m a dirty, filthy, greasy (especially greasy) stinking liar, because I don’t own five cars; there’s a sixth. I’ve been afraid to tell you all this because I’m already ashamed of my addiction. But it’s not what you think, I promise. Before you guys start thinking “Oh boy, Dave needs to go to car rehab. Who knows how many other cars he owns that he hasn’t told us about,” let me assure you: I own a total of six automobiles. Six. There are exactly 24 wheels in my garage (plus spares and the ones that steer). I have no other automotive mistresses. There isn’t a rusty VW Type III Squareback or anything hidden under a tarp in my backyard (but if you know one that’s for sal— SNAP OUT OF IT, DT), and I’m committed to using the advice you gave me to bring my car collection down to normal-human levels. But there’s a reason why I’m not so worried about this secret sixth car, and it has a lot to do with why I got this beautiful pony in the first place. I then invited Matt to talk to my car club about car culture. I posted flyers all over the University trying to convince students to attend “Cars and Pizza.” The event went well. Fast forward a few months, and Matt and I are driving in a new Porsche Boxster press car and we happen upon a sad, tired-looking Ford Mustang sitting next to a Ford Aerostar in the back of a gravel limousine parking lot. We stop to have a look. The car was filthy and being used to store old tires. But a quick peek underneath and inside showed a completely rust-free body and, beneath the dirt and grime, a nice coat of Candy Apple Red paint. For the next six months, every time I walked by that lot, I drooled over that abandoned Mustang. The doors were unlocked, so I had a look at the interior. It was filled with notes from prospective buyers. “Hey, if you ever want to sell this to me, call me at...” they all read. One day, as I walked by the apple of my eye, I decided I’d try a half-assed attempt at getting ahold of the Mustang’s owner by asking some random guy walking down the sidewalk. “Hey, any chance you know who owns this car?” I asked. Somehow, by the grace of the automotive gods, this random guy was pretty sharp, and told me to call the number on the side of the limousines in the lot. Next thing you know, I’m talking to a lawyer who was in charge of dealing with the estate of a deceased UVA professor. He told me the car got caught up in legal complications, and that he’d put me at the top of the prospective buyer’s list. After about a month, the lawyer calls me and sells me the ‘stang for $4,500. But this car wasn’t for me. Nope, as soon as I saw that 1966 Mustang, I knew this car was meant for my brother, who has been obsessed with early Mustangs since the beginning of time. Every birthday and christmas, he’d get a vintage Mustang shirt, calendar, or some sort of other random Mustang-themed memorabilia. He’s obsessed. But my brother works as a geologist in Hong Kong. That meant I couldn’t show him the car in person, so I called him up via Skype and showed him pictures, keys, a fresh new license plate and said “this is your car.” That moment was priceless. If everyone had their dream car in their garage, I’m convinced the world would be a better place, and to be able to give someone theirs is just an awesome thing. Many people spend their whole lives lusting over a machine, never to actually drive it. But now my brother has his. And that’s worth way more than $4,500. Since my brother lives on the other side of the world, I’ve had to take care of the ‘stang for him until his triumphant return to the home of the brave. The title is still in my name, so it’s technically my sixth car. For the last year of college, the Mustang sat in a garage that I managed to bum from a friend (see picture above). I drove it every once in a while, and used it as a tool to teach basic automotive concepts to our car club. But while the Mustang looks nice, it doesn’t run very well, and doesn’t seem to want to idle. And as much as my inner wrench wanted to, I refused to fix up the Mustang. I’m leaving that job to my brother, because I know wrenching on the car will create a bond between him and that machine, and who am I to deny him of that? We started creating that bond when my brother was home for Christmas one year. We swapped the carb, fuel lines, gas tank and radiator. Then my brother went for his maiden voyage in his dream car. It didn’t go so hot. See that house with the green shutters? Yeah, that’s my parents’ house. The ‘stang didn’t make it far. Still, I look forward to wrenching on the car with my brother when he gets back. In the meantime, the car is sitting in a storage locker somewhere in Richmond, Virginia. Hopefully it’s not a pile of junk by the time he returns, whenever that might be.